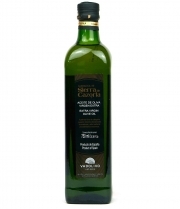 Extra virgin olive oil mechanically extracted from mostly cornicbara and manzanilla varieties as well as verdeja, carrasqueña, picual and gordal. For the development of these olive oils, only olives that are collected by flight are used, meaning those on the ground are not used. The result is an extra virgin olive oil that is low in acidity, with a yellow colour mixed with green tones and fragrant aromas with touches of bitter and spices in perfect harmony.